We are offering high-end quality of Asbestos Cement Sheet to our clients. These Asbestos Cement Sheets can be customized as per our precious customers specifications by our vendors end. 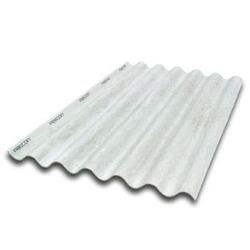 These Asbestos Cement Sheets are widely known for its durability and quality. We have in the offering a extended range of asbestos cement roofing sheets which are available in different specifications/standards. We can provide asbestos cement roofing sheets to use in greenhouse, industry houses, horticulture, agriculture, rain-shield. Annai agencies is a dealer for Visaka AC Sheets. We have carved a niche amongst the most dominant names in this domain, engaged in offering AC Sheet. We are a remarkable entity in this domain, engaged in offering a qualitative assortment of Asbestos Cement Sheet. Due to our immense capability in this work domain, we have brought forth a huge variety of Asbestos Cement Sheet.